Welcome to issue #739 of The Magazine of Fantasy & Science Fiction, a prime number for another prime set of offerings. Our September/October 2018 volume celebrates the magazine’s 69th anniversary with eleven new stories and a poem, plus all our regular columns and features. This month’s cover illustrates “Powerless” by Harry Turtledove. The artwork is by the award-winning artist Michael Garland. It’s been more than a decade since Harry Turtledove appeared in our pages, and we’re glad to welcome him back with “Powerless,” a novelet inspired by Vaclav Havel’s famous essay dissecting “government by bureaucracy” and its tools of oppression. This alternate history may be set in Red Southern California instead of Cold War Eastern Europe, but that’s only because, as you’ll see, totalitarian systems can arise anywhere, at anytime… and so can resistance. Our fantasy this month includes “Shooting Iron,” by Cassandra Khaw and Jonathan Howard, a story that takes everything you think you know about Western tropes and turns them on their heads. We fell in love the gunslinger Jenny Lim, and we think you will too. Yukimi Ogawa returns to our pages with “Taste of Opal,” an adventure story unlike any other we’ve read recently. We also thought it was a great example of the kishōtenketsu plot structure that has been reaching new audiences in recent years. Geoff Ryman brings us “Blessed,” a contemporary fantasy that takes place in Abeokuta, Nigeria, where the Aké Literary Festivals, named for the birthplace of Nobel Laureate Wole Soyinka, are held. And Bonnie Jo Stufflebeam, a Tiptree Award Honorable Mention and Nebula Award finalist, makes her F&SF debut with “The Men Who Come From Flowers,” a story that might disturb you but one that will definitely make you think. This month’s selection of science fiction spans the spectrum of the genre. Regular F&SF contributor Brian Trent takes us to the near future and introduces us to “The Memorybox Vultures,” a twisty thriller that asks who owns our social media identities and what happens to them after we die. Jeremiah Tolbert makes his F&SF debut with “We Mete Justice With Beak and Talon,” another near future story where AI-equipped eagles hunt illegal drones. In “Suicide Watch,” Susan Emshwiller takes us to a future where companies offer Death Tours to profit from despair. And Sarina Dories returns to our pages with “Impossible Male Pregnancy: Click to Read Full Story,” a humorous tale ripped right from the clickbait headlines. But we also head off to outer space. Brenda Kalt shows us “The Gallian Revolt as Seen from the Sama-Sama Laundrobath” – everything you need to know is right there in the title. And Gregor Hartmann returns to the magazine accompanied by “Emissaries from the Skirts of Heaven,” a life-spanning story that’s part of his on-going series set around the planet Zephyr. Charles de Lint recommends some Books to Look For by Juliet E. McKenna, Izzy Robertson, Alex Bledsoe, and Melissa F. Olson, and reviews Barry M. Malzberg’s new essay collection and A.D. Jameson’s I Find Your Lack of Faith Disturbing, about Star Wars and the triumph of Geek Culture. In her Books column, Elizabeth Hand offers indepth reviews of The Mere Wife by Maria Dahvana Headley and Strange Stars: David Bowie, Pop Music, and the Decade Sci-Fi Exploded by Jason Heller. And for our monthly Curiosities column, rediscovering lost writers and books, Mike Ashley visits A Prisoner in Fairyland by Algernon Blackwood, the 1913 novel that introduced the idea of the Starlight Express. In his latest television column, Tim Pratt reviews the first two seasons of “The Good Place” before Season 3 premieres at the end of September. And in our science column, Jerry Oltion pokes at “The Telltale Vein,” exploring blood tests, how they work, and everything they can reveal. The print version of the magazine also offers up cartoons by Bill Long, Arthur Masear, and Kendra Allenby. Welcome to issue #738. 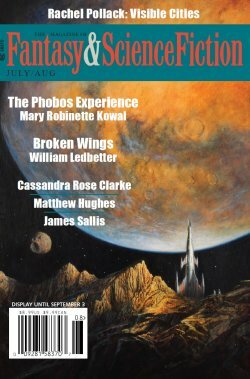 The July/August volume of The Magazine of Fantasy & Science Fiction enlivens your summer reading with ten brand new stories and a poem, plus all our regular columns. It’s perfect to take to the beach, to read on your train or flight, or simply to enjoy while lying in a hammock in your own back yard. Subscribers are already receiving their issues. But if you’re looking for a copy, you can find us in most Barnes & Noble stores, as well as many local independent booksellers. You can also order a single copy from our website or buy an electronic edition from Amazon, AmazonUK, and — now, available worldwide and in every electronic format — through Weightless Books. This month’s cover shows “Big Mars.” The artwork is by the Hugo Award winning artist Bob Eggleton. Sometimes, when you publish a fantasy and science fiction magazine, Bob Eggleton paints a picture of the moons of Mars and you snap it up for your cover and then you go looking for stories and a poem to match. If you’re smart, one of the first people you go to is Mary Robinette Kowal. “The Lady Astronaut of Mars,” her alternate history of space exploration, won the Hugo Award in 2014, and she revisited that world in “Rockets Red,” which appeared in our January/February 2016 issue. Now she has two books coming out that are set in the same universe. “The Phobos Experience” is a standalone adventure that takes place in a past where we’ve already sent people to the red planet and its larger moon, and we think it perfectly matches the retro spirit of this month’s cover art. If you’re really smart, you might also turn to William Ledbetter, not just because he’s a bona fide rocket scientist, but because he’s already written so many entertaining space adventures, published in these pages and elsewhere. “Broken Wings,” much like “The Long Fall Up,” his Nebula Award winning novelet from our May/June 2016 issue, features regular people put into situations that test their mettle and push them to the limits of their abilities. We also turned to one of our most favorite and versatile poets, Mary Soon Lee, who brings us “Red Rising,” if space rebels are your thing. This issue’s memorable novella quickly brings us back down to Earth. L. X. Beckett makes her F&SF debut with a story that explores what happens when social capital collides with the gig economy and holds our livelihoods and even our lives in the balance. This is the first story we’ve seen across our transom that imagines a near future where these trends are pushed to their potential extremes, and we think the issues here are worth exploring. Our other science fiction this month includes “Morbier” by R. S. Benedict, who debuted last year in F&SF with “My English Name” and “Water God’s Dog.” It takes place in the unlikely setting of a country club in Connecticut. And James Sallis brings us “Bedtime Story,” a flash piece about an alien invasion that won’t help you sleep any easier. The issue also has plenty of fantasy served up. “The Queen of the Peri Takes Her Time” by Corey Flintoff is based in part on his experiences as a foreign correspondent who frequently traveled through Dubai. Rachel Pollack returns to our pages with “Visible Cities,” which presents the origin story of Jack Shade’s lover and fellow Traveler, Carolien Hounstra. “Hainted” by Ashley Blooms, who is making her first appearance in the magazine, is set in the coal-mining hills of Eastern Kentucky. And “The Adjunct” by Cassandra Rose Clarke will take you back to school and teach you a few things you didn’t know about universities and the universe. Charles de Lint recommends some Books to Look For by Steven Brust, Ken Grimwood, Patricia Briggs, Brian Andrews, and D. N. Erikson, and takes a close look at A Lit Fuse: The Provocative Life of Harlan Ellison, the new biography by Nat Segaloff. Michelle West is Musing on Books by Tanya Huff, Aliette de Bodard, Hannu Rajaniemi, K. R. Richardson, Robert V. S. Redick, and Ursula Vernon. And for our monthly Curiosities column, rediscovering lost writers and books, Paul Di Filippo explores The Wreck of the Titan, or Futility, by Morgan Robertson, a 1912 novel that seems to predict the fate of the Titanic. In his latest film column, David J. Skal goes to Netflix and looks in the queue at “The Ritual,” “The Frankenstein Chronicles,” and “Altered Carbon,” which he recommends, and “Mute,” which he does not. And in our science column, Jerry Oltion explains “Why Do Kites Fly.” The print version of the magazine also offers up fresh cartoons by Nick Downes, Bill Long, and Danny Shanahan. So grab a copy in your favorite format and take a reading vacation. Enjoy! Welcome to issue #737. 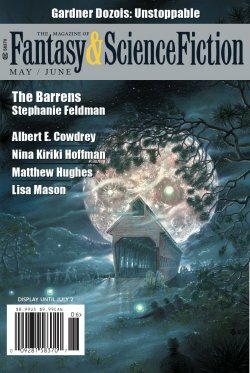 The May/June volume of The Magazine of Fantasy & Science Fiction takes off with eleven brand new stories, all our regular columns, and the winners of the latest F&SF Competition. You won’t want to miss it. If you’re a subscriber… well, you’re probably already reading the issue by now! But if you’re looking for a copy, you can find us in most Barnes & Noble stores, as well as many local independent booksellers. You can also order a single copy from our website or buy an electronic edition from Amazon, AmazonUK, and — now, available worldwide and in every electronic format — through Weightless Books. This month’s cover illustrates “The Barrens” by Stephanie Feldman. The artwork is by the World Fantasy Award winning illustrator Alan M. Clark, his first piece for F&SF. To see more of his work, visit his website at alanmclark.com. Stephanie Feldman won the Crawford Award for her debut novel, The Angel of Losses, published by Ecco in 2014. She has recently started writing short fiction as well, and “The Barrens” marks her first appearance in this magazine. She tells us that her story is what happens when you mix four years of being a DJ for your college radio station with a decade of reading Weird NJ magazine and a lifetime of watching horror movies. We think you’re going to enjoy this twisty tale. Over the past year and a half, Baldemar has quickly become our favorite wizard’s henchman… even though his master Thelerion is no one’s favorite wizard (except perhaps his own). Matthew Hughes introduced us to the streetwise young Baldemar in “Ten Half-Pennies” in our March/April 2017 issue, and gave him bigger problems to solve when he came face-to-face with “The Prognosticant” in our May/June 2017 volume. In “Jewel of the Heart,” which appeared earlier this year, Baldemar’s encounter with the Helm of Sagacity saw him rewarded with the gift of luck. Now in his latest adventure, “Argent and Sable,” Baldemar’s about to find out that maybe not all that luck is good. Our science fiction this month includes “Crash-Site,” an outer space adventure set in the War Hero universe by Brian Trent, who’s beginning to become a regular in the magazine. Lisa Mason has appeared recently in these page with tales of dark fantasy, but this month she brings us “The Bicycle Whisperer,” a near future story about bicycles, freedom, and forgiveness. And Nina Kiriki Hoffman asks us to explore “The Properties of Shadow,” a far future story about art, an artist’s assistant, and the secret shadow selves that all of us hide. Nor have we neglected the fantasy portion of our title. Gardner Dozois brings us “Unstoppable,” a fairy tale about a king’s use – and misuse – of magic. Can those who abuse their power ever be stopped? Dare Segun Falowo, an extraordinary young Nigerian writer who debuted with “We Are Born” in our September/October issue last year, returns this month to the village of Àlá (which means dream in his traditional Yoruba) with “Ku’gbo,” a story about change and growth. And Albert E. Cowdrey asks us to “Behold the Child,” a reminder that perhaps, as Hemingway observed, all truly wicked things start from innocence. In addition to the familiar faces, we also welcome three young authors making their first appearance in the magazine. Amman Sabet introduces us to “Tender Loving Plastics,” a near future science fiction story about the foster care system. In “Inquisitive,” Pip Coen relates the experience of Saffi, a young neuroatypical girl who struggles to find her way in a very rigid society. And Melanie West gives us “What You Pass For,” a historical fantasy inspired by the life of Janet Collins, an African American dancer in the 1930s who was offered a position with a prestigious ballet company on one condition, that she paint her skin white before appearing on stage. Charles de Lint recommends some Books to Look For by Kij Johnson, Craig Schaefer, and Carolyn Turgeon, along with two new books celebrating the twenty-year anniversary of Buffy the Vampire Slayer. With “Tourists and Native Speakers,” James Sallis provides a thoughtful and critical perspective on recent science fiction, literary, and mainstream fiction. And for our monthly Curiosities column, rediscovering lost writers and books, Phoenix Alexander introduces us to the work of George Schuyler and The Beast of Broadhurst Avenue, a rare early example of African American science fiction. In her latest film column, Kathi Maio considers some of the big problems and small triumphs of “Downsizing,” the latest in a long tradition of films about shrinking people. And in their final science column for the magazine after more than twenty years, Pat Murphy and Paul Doherty are “Asking Questions.” And the print version of the magazine also offers up fresh cartoons by Kendra Allenby, Arthur Masear, and Nick Downes. 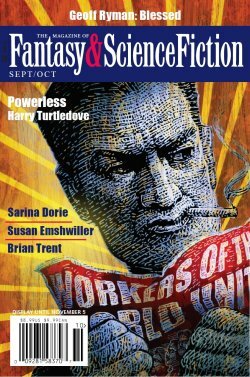 We also announce the winners of F&SF Competition #95, “Titles the Rearrange,” and welcome everyone to participate in Competition #96, “Crime Blotter,” for a chance to win some pretty cool prizes, including subscriptions to the magazine. So grab a copy in your favorite format and treat yourself to this month’s fabulous stories and features. 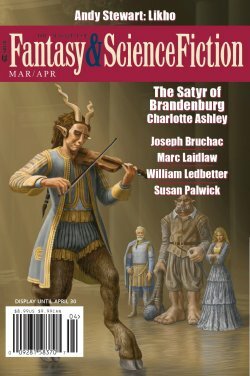 The March/April edition of The Magazine of Fantasy & Science Fiction features the return of the Faerie duelist La Héron in a new story by Charlotte Ashley, plus so much more. This month’s cover illustrates “The Satyr of Brandenburg” by Charlotte Ashley. The artwork is by Cory and Catska Ench. To see more of their work, visit their website at www.enchgallery.com. Charlotte Ashley introduced regular readers of this magazine to the Faery duelist La Héron and her brawl-first, ask-questions-later assistant Sister Louise-Alexandrine three years ago in our March/April 2015 issue. The story was a finalist for the Aurora and Sunburst Awards, and since then Charlotte Ashley has become one of the magazine’s favorite new writers, bringing us an alternate history of Canadian settlement in “More Heat Than Light” (F&SF, May/June 2016) and another story of duelists, “A Fine Balance” (F&SF, November/December 2016). This new adventure was inspired by the famous fencing exhibition between the Chevalier de Saint-Georges (an Afro-French symphony conductor and professional duelist) and La Chevalière D’Eon (a transgender French diplomat, soldier, and spy) at Lilles in April 1787. After publishing “Wormwood is Also a Star,” a story about Chernobyl, politics, and children with strange powers, in the May/June 2013 issue of F&SF, Andy Stewart found that he could not stop thinking about the damaged nuclear reactor and the political situation in the Ukraine, especially when he was reading profiles of young urban explorers sneaking into Pripyat armed with Geiger counters and cans of spray paint. The result is this hallucinogenic novella that goes into the heart of a great disaster to find something even worse. 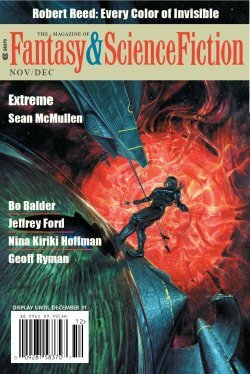 Our other fantasy offerings this month include “Hideous Flowerpots” by Susan Palwick, a story about acceptance and healing, “The Next to the Last of the Mohegans” by Joseph Bruchac, making his F&SF debut, and “A Swim and a Crawl,” a dark fantasy about being caught between the ocean and the cliffs, by F&SF regular Marc Laidlaw. For the science fiction portion of our title, we have “Deep Sea Fish,” hard science fiction about the exploration of Titan, written by Chi Hui, one of China’s celebrated young authors. This translation by Brian Bies is the story’s first appearance in English. We also have another story of humanity’s future, “A Dog of Wu” by Ted Rabinowitz. And Wole Talabi returns to the magazine with “The Harmonic Resonance of Ejiro Anaborhi,” a story about a young girl in Nigeria, a mysterious artifact, and the cost of social protest. Finally, we close the issue with “Down Where Sound Comes Blunt,” a new story from World Fantasy Award winner G. V. Anderson. We aren’t going to tell you anything about the story because we don’t want to give anything away. The issue also includes two poems, “Diaspora” by Mary Soon Lee and “After the Wolf,” a sneakily acrostic piece of verse by Jeff Crandall, making his first appearance in the magazine. In his latest film column, David J. Skal takes you to the fiftieth Sitges Festival Internacional de Cinema Fantastic, an annual October event on the Catalonian seaside just outside Barcelona, and covers a wide range of new international films, including a review of festival favorite “The Shape of Water.” Jerry Oltion makes his science column debut with a piece on “Naked Eye Astronomy.” And the print version of the magazine also offers up fresh cartoons by Arthur Masear, S. Harris, Danny Shanahan, Bill Long, and Kendra Allenby.